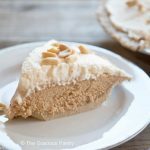 Peanut butter pie has never been healthier or more delicious!! In a large mixing bowl, combine all the filling ingredients. It will take a few minutes of whisking to really get the milk mixed in well, but you'll have a very creamy filling when it finally does. So just keep mixing. If your pie crust is raw, you'll want to bake it first before filling it. Bake at 350 F. for about 10-15 minutes, or until it's completely baked through. Allow to cool completely before filling with pie filling. Scoop the filling into your prepared pie crust and smooth it out with a spatula. Please note that the nutrition data below is a ballpark figure. Exact data is not possible. Also, data does not include crust.